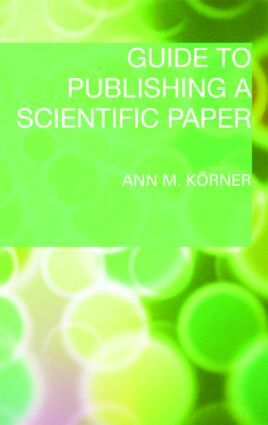 "Guide to Publishing a Scientific Paper" provides researchers in every field of the biological, physical and medical sciences with all the information necessary to prepare, submit for publication, and revise a scientific paper. The advice provided conforms to the most up-to-date specifications and even the seasoned writer will learn how procedures have changed in recent years, in particular with regard to the electronic submission of manuscripts. Every scientist who is preparing to write a paper should read this book before embarking on the preparation of a manuscript. This useful book also includes samples of letters to the Editor and responses to the Editor's comments and referees' criticism. In addition, as an Appendix, the book includes succinct advice on how to prepare an application for funding. The author has edited more than 7,500 manuscripts over the past twenty years and is, consequently, very familiar with all of the most common mistakes. Her book provides invaluable and straightforward advice on how to avoid these mistakes. Dr. Körner is a professional editor and writer. She has an undergraduate degree from the University of Cambridge and a doctorate in Molecular Biophysics and Biochemistry from Yale University. Congratulations, your paper has been accepted!